The traditional methodology of carrying out design and construction has followed the same linear interaction between Client to Architect to Consultants to General Contractors. At times, and no matter how clear information has been passed between each other, the accuracy achieved throughout a project is often compromised. a continuous accounting of the construction costs during all phases which instills budgetary control. Our L360AP focuses on building your project twice: once in the virtual world where we pro-actively flush out and eliminate potentially costly coordination concerns before being placed in the hands of General Contractors, and then again, for a second time through fully coordinated construction documents created from the digital model continually developed through all stages. The L360 ARCHITECTURE Process resolves problems, reduces conflicts and instills cost control. We have reimagined the design process to provide crystal clear communication that results in benefitting your bottom line. The basis of “how” we carry out our projects is unique and simple. We understand the importance of listening intently, documenting concisely, committedly, carrying through the needs and wants of our Clients. Our L360 ARCHITECTURE Experience provides an unparalleled and highly interactive team environment based on the 3C’s of Architecture: Communication, Collaboration and Coordination. The 3C’s is not only our motto, it is the philosophy upon which L360 ARCHITECTURE was built and it is the foundation of every project we undertake. Clients become engaged in all phases of the project and sincerely share a seat at our table through the entire project development process. 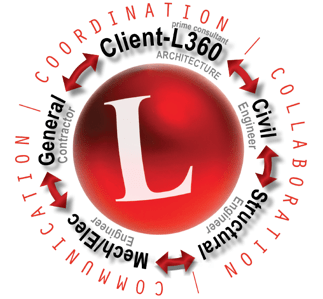 L360 ARCHITECTURE leverages technology as a cornerstone for discussion, offering clients the opportunity to play a major role in controlling the shaping of their projects. Throughout the design phase, we are committed to collaborating continuously with our Clientele to ensure that the basis of our work is a direct translation of the Client’s shared needs. We guarantee that our service instills crystal clear communication that results in schedules being met and budgets being kept in control.